I'd love to welcome you to my bright and airy apartment. 'O Laranjal' named for the orange grove which it overlooks and the smell from whose blossoms pervade the flat in Spring. O Laranjal which is fully licensed under the Portuguese Local Lodging system sleeps up to six adults in three bedrooms each with a double bed and there is a fold-out bed in the living room for a child or temporary guest. O Laranjal is well supplied with everything you need to make your stay a relaxing one. It has free unlimited and hi-speed wi fi. The flat-screen TV has English, French, German, Spanish and of course Portuguese channels. My bookcase is crammed with paperbacks; mainly in English but some French, Dutch and Russian books too. There are DVDs too and the apartment has a CD player, a DVD player and there are even board games. The flat has air-conditioning and electronic shutters throughout. The large kitchen at O Laranjal is well-equipped with electric, oven, microwave, fridge freezer, dish-washer and washing-machine, as well as lots of cooking utensils. There are also a variety of ways for you to make your coffee in the morning so relax and have it on the balcony while enjoying the view and watching the birds. Being a bit of a coffee afficionado myself, I have a Nespresso machine, Cafetières and a drip coffee machine. O Laranjal is a first floor property which can be accessed by a lift if need be. It is therefore suitable for the less mobile guest and there are even grab rails in the bathrooms. The lift goes up to the roof terrace too. 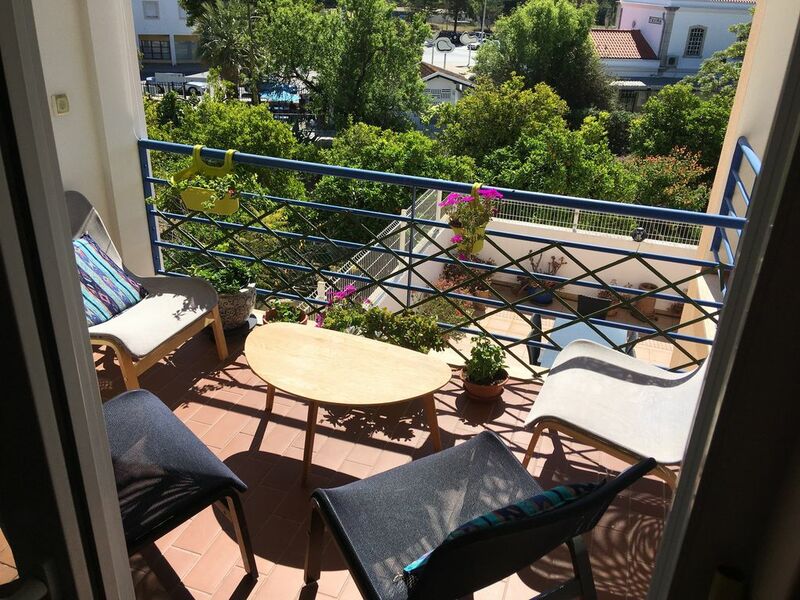 Unlike many of the holiday apartments in the Tavira area, O Laranjal is on the edge of the town centre, so everything is easy to reach, either on foot, using public transport or in a car. There is free parking in the vicinity. On both sides of the town you go uphill as you move away from the river so you do have to walk uphill a bit to get back to the apartment from the town centre. O Laranjal has three balconies and a private section of roof terrace on the third floor, so it is easy to enjoy the magnificent views. On one side it overlooks an orange grove situated in the rump of an old farm, the Quinta do Caracol, on which the block of flats was built. The quinta gives its name to the part of Tavira where the apartment is located. From it's elevated position you can see out to sea from the terrace and two of the three balconies. The apartment has three double bedrooms the master being en suite and with its own balcony. Each bedroom has plenty of storage space. The en suite bathrooms has a bath and (shower over it), toilet and bidet the other bathroom has a shower and toilet. The kitchen is spacious and opens out onto a terrace with a built in BBQ. A great place to eat or relax with a drink after your busy day swimming, golfing or sightseeing. The living-dining room is open plan with access to another smaller balcony. Tavira is a lovely small town in the Eastern Algarve with loads of history. It was first settled by the Phoenecians in the 7th Century B.C., later both the Romans and the Moors arrived. I currently live most of the year in York in the UK with regular trips to Tavira. In 2014, having found the beautiful town of Tavira in the relatively unspoilt eastern Algarve, I decided to look no further and bring forward my plan of having a second home in Portugal before retirement. Three years ago I took early retirement from my job as a University lecturer and I have just qualified as a Traditional Chinese medical practitioner. This means I can't visit my flat in Tavira for long visits any more but I can still come more often than I was able to when working full time at the university. I look forward to relaxing, enjoying the sunshine, strolling by the river and eating out at one of the many restaurants in Tavira and nearby towns. The town is popular with tourists from Portugal and Spain as well as other Europeans so retains a traditional feel. I chose to buy here because I love the town of Tavira with its ready access from the airport, which is important if I’m only here for a few days. Tavira has something for everyone with its lovely architecture, cobbled streets, cafés, great restaurants & nearby beaches, golf courses and nature reserves. I chose the property for its elevated position with great views and beautiful light and airy atmosphere . I also wanted easy access to the bars and cafés in the centre of town as well as the beach and to have easy access to public transport to nearby towns when I come without a car. My property is a bright and airy apartment with modern facilities including hi speed broadband and multi-language TV channels enjoying great views out to the sea over a lovely orange grove. It’s a short stroll from the old world charm of historical Tavira. As well as benefiting from being just a 10 minute walk or so to the castle and the centre of town it has great access to routes out of town and the motorway. A choice of beaches and the nearest golf course are less than fifteen minutes drive away and other Algarve towns and nearby Spain are just as easily reached by public transport. O Laranjal can be booked using alternative payment methods which allows you to avoid paying the OD service charge. Search for O Laranjal on fb. En-suite to Master bedroom with double sinks and vanity unit, bath and shower over, wc and bidet. Hairdryer. 2nd bathroom with 90cm quarter circle walk-in shower, sink with vanity unit and wc. Hairdryer. Sea view from the living-dining area and roof terrace. Tavira is an ancient town and is one of the most unspoilt in the Algarve. The river Gilao runs through the centre of Tavira with lots of restaurants and bars looking over it. Air-conditioning units in all rooms except bathrooms and corridor. Heating fans in all rooms except bathrooms. Additional portable heater available if needed in winter. For longer stays a change of linen is provided. Cleaning at the end of your stay is provided. Upon request we can usually arrange a cleaner to come during your stay at your own cost. Large bright living-dining room. Flat screen TV with multi-language channels. Unlimited hi-speed broadband, CD player, DVD player. Comfy seating for up to 6. Table with four chairs and two stools in the dining room but two more chairs are available on request Table and four chairs on the roof terrace. Small tables on balconies with seating for up to six. Package of international channels. Given the inclusive hi-speed broadband, TV streaming via internet is also available via Chrome Cast for those guests with their own computer or tablet. A well-stocked bookself with mainly English books but some in French, Dutch and Russian. Board games including Monopoly, Scrabble, Boggle, Backgrammon. Playing cards. Jigsaw. A selection of CDs covering eclectic and international taste. Library of English films and box sets and some French films. Private section of roof terrace. There are four Golf courses under thirty minutes drive away. Benamor golf, Quinta da Ria, Quinta de Cima, Castro Marim Golf and the most prestigious of all, the Monte Rei Golf & Country Club. The closest (Benamor) can be reached in under 15 minutes. The apartment is located on the 1st floor and accessible by elevator and staircase. There is ramp access to the front of the building. The roof terrace can also be accessed via the lift. Grab rails are present in both showers. Notes on accommodation: The apartment is licensed and has been inspected by the local council and is equipped with a smoke alarm, fire extinguisher, fire blanket and first aid kit. (Local lodging license 7161/AL) Outside: 3 balconies, one with BBQ, Private roof terrace with town and sea views. Utility Room: There is no separate utility room but equipment provided includes, cooking utensils, iron and board, mop & bucket, clothes line & pegs, broom, dust pan & brush, vacuum cleaner. Two mosquito nets (rarely used) and a hammock are also available. Cleaning / Towels / Linen / Maid service: Bed linen and towels (excluding pool & beach towels) included. Linen change provided for longer stays. Final cleaning included. Extra housekeeping can usually be arranged for you upon advance request. Other: Roof terrace. The apartment has an A rating for energy and has electric shutters throughout. Sorry no smoking except on the balconies and roof terrace and no pets. We enjoyed a wonderful month at O Laranjal in Tavira. Situated within an easy walk to the centre of Tavira, this apartment offers comfortable modern living while being close enough to the shops, cafes and restaurants along the river front. We especially enjoyed sipping our morning coffees on the balcony, listening to the birds singing in the orange grove below. Our host Bernadette was accommodating in adjusting our dates and responded quickly to our requests. Thank you Bernadette for sharing O Laranjal with us. I am really glad that you enjoyed your stay at O Laranjal and hope to see you back at some time in the future. We enjoyed our stay in Tavira. It is a lovely town, all within walking distance of the apartment. The apartment is very spacious and comfortable, with great air conditioning. We would definitively recommend it and stay there again if returning to Tavira. always good to hear that customers would stay again. We were four senior's and were all very happy with the apartment. It was even nicer than the pictures showed! All conveniences, modern, spacious, clean, quiet- it just couldn't get any better. Our hostess was more than accommodating and we would definitely go back. The apartment itself was lovely. It is exactly as the photographs show. However,we arrived to find workmen laying a new concrete floor on the patio in the apartment below us and then laying tiles. This work lasted a full week and rather spoiled sitting out on the balcony due to lack of privacy and noise. This was not the fault of the owner of the apartment I hasten to add ..... just our bad timing! Whilst we we knew the apartment was a 10 minute walk away before booking, it is worth noting that the walk is downhill so consequently the return walk is uphill. You would need to factor this is in. We found a little oasis in the Sotovento Bar which is beside the train station and on the way to Lidl. This is a little local establishment serving the usual drinks, coffee, pastries etc. It was a life saver and we even got to know the locals and they us. I am so sorry that your full enjoyment of my apartment was spoiled for half of your stay. I was aware that at some point the neighbours would be having some repair work done to the patio, due to heavy rains last year causing water to leak through to the foundations of the building. However, a) I was given no notice that the work was about to start and b) I had been told that when it did happen it would last no more than a couple of days. I am therefore appalled that the work lasted a whole week. As you said in your review this situation was not of my making and and the timing of the repair was totally outside of my control. I assume that now that the problem has been resolved downstairs, this situation will never arise again. Nevertheless, given what happened, I would be happy to give you a discount if you were to return for a stay in the future. Please contact me direct before booking at any point in the future if you would like to take advantage of this discount. I am sorry if I did not make clear in my advert that the walk back from town is uphill, although I think it does mention that the apartment occupies an elevated position. Of course, prospective visitors who do not know Tavira would not know that any apartment a little way away from the centre is uphill. The gradient is steeper on the other side of the river, though. I will try to rectify this lack of clarity in my advertising in the future. I am very glad that, temporary noise problems aside, you liked my 'lovely' apartment and hope to have you to stay again some time. Bernadette's apartment is lovely. It is spacious and clean with 3 lovely balconies and a roof terrace and has everything you could need. It's only a short walk into Tavira. Thanks for your great review Sharon. I am very glad that you found the apartment so nice. I look forward to having you back at O Laranjal in the future. It won't be long now till I'm back there myself for my next trip and I'm really looking forward to it. It is a beautiful 'lived-in' apartment about 10-15 minutes' walk from the centre of town. There is everything you would need for your stay. A well equipped kitchen, nice big but cozy living room with books and info on the area, as well as TV, DVD and stereo. Good wifi. Three double bedrooms with comfy beds and two bathrooms, air conditioning in all the bedrooms. Three small balconies - we had all our meals on the kitchen balcony overlooking an orchard and the back of the train station which was about a 7 minute walk from the apartment. There's also a roof terrace where we had pre-dinner drinks over-looking Tavira Island and the town. There's an Aldi and a Lidl, both large, in different directions - both about 8-9 minutes' walk. Lots of good cheap food. Tavira is not a resort town, and not really a place for families with kids as there's not really anything aimed at them. It's very genuine and great for adults wanting to see a picturesque traditional town in the Algarve. There's a road train for 4 euro that takes you round the various areas of the town. There is taped commentary in English and Portuguese, but you can't really hear much of it through the speakers. But it's a good introduction to the town. Lots of cafes and hotels in the main area (and plenty of historic churches), and a ferry to the Ilha de Tavira which leaves regularly. It's a 15-20 minute journey but unbelievably it only costs 2 euro for a return ticket! There's are good beaches on the island but if you can, take your own umbrella. Otherwise you can rent one for 13 euros for the day. At 30+ degrees you'll need one! Trains are regular and on time, and very cheap! If you're over 60 and from the EU, they are half price! They go to Vila Real on the border with Spain to the east, and Faro to the west. I would definitely go back to the area another time, and stay in the same place but would rent a car next time to be free to explore further afield and go to places that would be difficult on public transport. As detailed in the next section, my apartment O Laranjal, is spacious and modern and is equipped with free hi-speed wi-fi an multi-language TV channels. I also make available, books in 4 languages, DVDs, CDs and games for your enjoyment. There are three beaches within easy reach of the flat. They sit on two sand bar islands, Isla de Tavira and Isla de Cabanas, which parallel the coast of the eastern Algarve. The Tavira-mar beach on Tavira Island is a blue flag beach reached by ferry or water taxi. There are restaurants and cafés on the island as well as water sports in summer but walk a bit from the ferry stop and you can find seclusion from the crowds. Terra Estreita is on the other end of the island which is 14 km long; in the summer this beach is reachable by ferry from the fishing village of Santa Luzia (which is just 3km west of the apartment) or from the main part of Tavira island. 1km further west is Pria do Barril , reached by a little train at Pedras del Rei, though you can reach it on foot, over the dunes. Further west of Praia do Barril there is a nudist section of beach. Ferries to the other island are from Cabanas a village resort 3-4 km east of Tavira. Faro airport is 30-40 mins away. The airport in Seville is only a 2 hour bus journey, less in the car. Car not essential, all amenities within walking distance. Faro: 40 km; Spain: 40 km. Easy access to many Algarvian towns and villages east and west via the Algarve railway line and local buses. Regular ferries to Ayamonte, Spain from Vila Real de Santo Antonio where the Algarve train line terminates. Ferry to beach: 1.5km (winter 2 km); Beaches: 3 -4 km; Nearest restaurant: 500 m; Supermarket: 250 m; Train station: 250 m; Golf: 4.5 km. Tavira is in the eastern Algarve. Shops, supermarkets, restaurants and bars are open pretty much all year. In the winter months it can rain but it rarely lasts more than a few days. As well as being suitable for golfers and beach lovers, the area is popular with bird watchers. The local salt pans and lagoons of the Ria Formosa nature reserve are well-known haunts for twitchers. Let me know if you need a recommendation for specialist help on this. In summer time there is an almost daily programme of open air events in the town square, or nearby, most of them completely free of charge. Even when it’s raining there are things to do in Tavira. The shopping centre the Gran-Plaza (Tavira’s mall) has 5 cinema screens as well as shops. Booking Notes: €350 initial payment to be paid upon reservation. Final payment due 55 days prior to arrival, or in full if booking within 6 weeks of arrival. Your reservation of the property is only secured after receipt of relevant payment. If paying by bank transfer, the returnable breakage and damage deposit of €350 is to be paid to clear no later than 3 days before arrival.It will be refunded via bank transfer, within 7 days of departure, except in exceptional circumstances. No service fee payable if payment is made by bank transfer. You may make a bank transfer in either Euros or Sterling. If paying in Sterling, the exact amount of the second payment will normally be adjusted depending on prevalent exchange rates. The apartment is no-smoking except in outside areas. Changeover Day: The changeover day is usually Friday. We will try to be flexible, especially outside of peak summer periods but this may depend on cleaner availability for a changeover and arrival on a Sunday may not be possible as my key holder does not work on Sundays. Check-In and Check-Out Arrival time from 16.00. Departure time 10.00. (unless otherwise agreed). If you may arrive after 11pm, please let me know upon booking. Notes on prices: Peak prices are based on full occupancy for a 7 day stay. During low season, a three-day stay would be approximately 50% of the weekly rate and a five-day stay approximately 75%.